St Mary’s is the oldest of the Parochial and National schools founded for “the benefit of the labouring classes of Putney”. 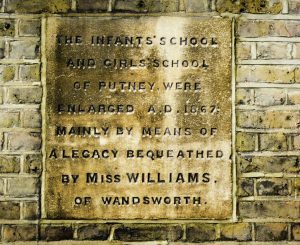 The School dates from a Deed of 1819 when it was ‘situated in a part of a field of two acres in the back lanes of Putney’. The oldest part of the building is the Hall block fronted by a garden on Charlwood Road. The main classroom block was built in 1867 as the Girls and Infants Schools, and was recently refurbished following repairs to damage sustained in World War II. As well as eight classrooms there is an ICT suite, an Art room, a Music Room and an Assembly Hall. There are two enclosed play areas for the Early Years in addition to a large, playground for the whole school. St. Mary’s originated as a Sunday School run by the Church of St. Mary the Virgin in Putney. In 1819 a Deed made it possible for St. Mary’s School to have its own building along Felsham Road on land donated by Earl Spencer. In 1833 the first government funds were given to schools and this enabled St. Mary’s School to develop and grow. 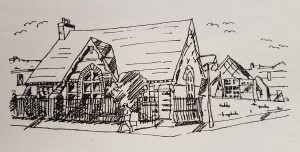 In 1867 a Miss Williams of Wandsworth left St. Mary’s School a large sum of money which was used to provide new classrooms for both the Infants School and Girls School. The Second World War was the most traumatic time for everybody at St. Mary’s. An incendiary bomb crashed through the roof of the Girls’ Upper School one night, setting the building ablaze! Drinkers at the nearby Half Moon pub formed a chain with fire buckets to try and douse the flames. The whole neighbourhood turned out to stare in horror or to try and help. The original iron railings from the school garden on Charlwood Road were dismantled and used for munitions to help with the war effort. In 1994 St. Mary’s School celebrated its 175th anniversary. To mark this important milestone in the school’s history a commemorative mug was designed and given to all of the children. The illustration on the left depicts some of the oldest parts of the school building (possibly dating back to around 1830) and was placed on the mug. 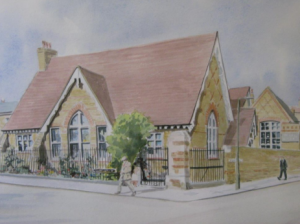 In April 2003 work began on an extensive expansion of the main school building to create a new first floor equipped with 3 new modern and spacious classrooms and larger staff room. During the extension work our Key Stage 2 classes temporarily moved to Hotham Primary School for 6 months. Restoration of other parts of the school saw the addition of a dedicated IT suite and art room. 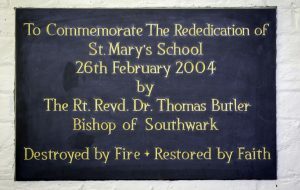 In February 2004 the expansion and restoration work of the school was complete and St. Mary’s School was rededicated by the Bishop of Southwark. A commemorative plaque was unveiled and makes reference to the fire that destroyed the school earlier during World War II. In 2012 the school joined in with the rest of the country to celebrate the 60th year of Queen Elizabeth II’s reign. 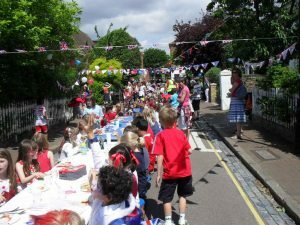 The entire school held a massive street party along Charlwood Road to commemorate the event. In 1891 St. Mary’s became a ‘Penny School’ because it cost 1d a week to attend. Felsham Road was previously made up of roads known as Gardeners Road and Worple Road! The oldest parts of the school (the hall block and current Year 3 classroom) is constructed of yellow London stock brick. In the early days of St. Mary’s School a ‘half-time’ system was in place: children would go to work at 5am, then attend school at 9am and go back to work at 5pm! This system was abolished in 1918 when employment of children under 12 was forbidden. 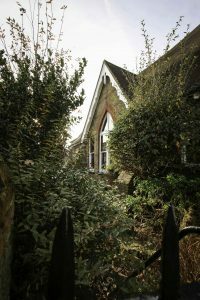 The old entrance to the school on Charlwood Road once had a great arch and was built in the gothic style typical of Church schools of the time. Gordon Goody – one of the Great Train Robbers in 1963 – attended St. Mary’s Infant School! In 2019 St. Mary’s School will celebrate its 200th anniversary!